This post is going to cover a web pet peeve of mine, so please pardon me while I take some frustration out on Yelp, Thumbtack and Trip Advisor. Recommended searches starting with “Best”. Pretty much every industry, or every business gets “Best of” searches within their local community. 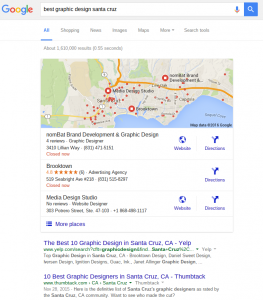 In addition to Best Web Design and Best Graphic Design in Santa Cruz we are going to take a look at the specific search “Best Restaurant” for this article. Google AdWords shows 260 monthly search for “Best Restaurant in Santa Cruz“. Directory companies like Yelp and Thumbtack know this traffic is there and they target it in every community, at least in the U.S. The worst part of this strategy, is that it ISN’T curated content. The pages that Google index for these guys is automatically generated junk, that may be accurate by luck, but most often it is total crap. Results for “Best Graphic Design Santa Cruz” Showing the top non-location results filled with junk content. The search results that got me going on this tangent were actually for a client, but since they are really affecting businesses across the board it was easy enough to use my own industry as an example instead. In the screencap to the left you see location based map results, which are great. They show highly rated graphic designers close to my current location. 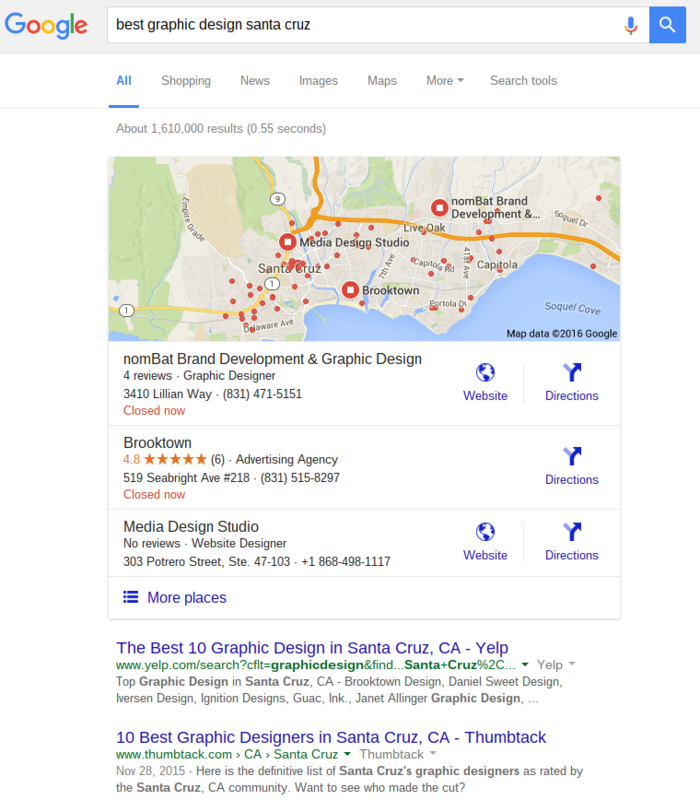 Which, is good content for a person searching for the best designer in Santa Cruz. The top two non-location based results are generated by a program though, not people, and not accurately. Ratings can be good, rating can be great, but when the program includes restaurants from 15-20 miles away “Over the Hill” then Yelp has completely missed the boat, and Google ends up serving garbage results. Sadly for the restaurant search term there were good, locally generated and real results from the Good Times on the page, but they were a good 4-5 positions below the spam content, and we all know that in search, if you aren’t first, You’re Last. So, I think I am about done with this rant. In six months this article will probably be outdated anyway, since Google really is good at fixing issues like this. But for now the 260 people searching for the best restaurant will just have to deal with low quality spam content.